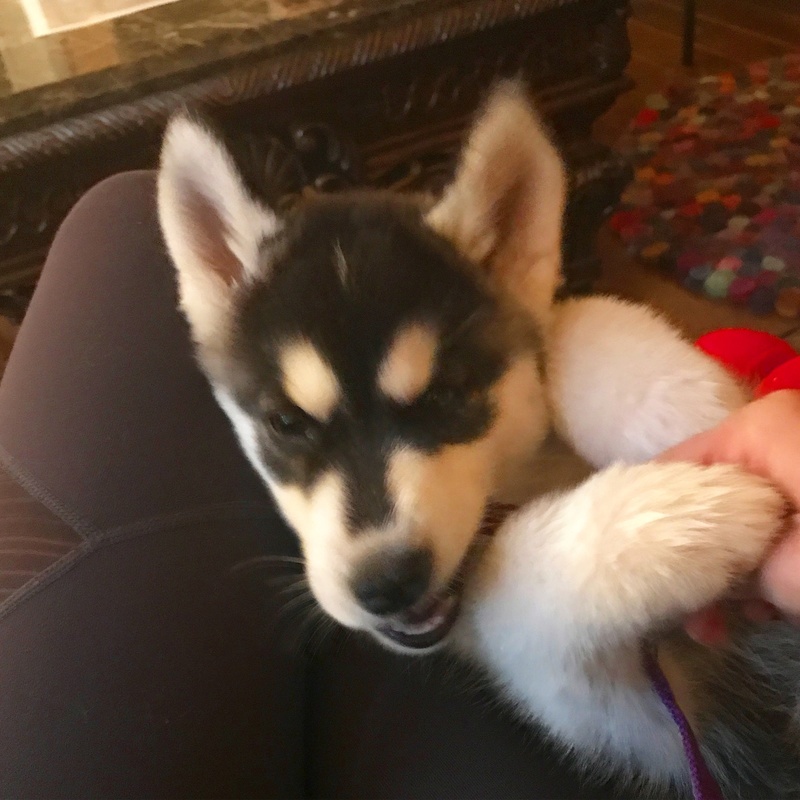 And lol on Sophia...I'm telling you, these little girl huskies are feisty! Al, Sophia is a hoot! She found Grant's tail easier to catch than her own. I left notes on Malukhai's photos. Such a beautiful baby! And yes, Sophia is a little too fearless. Sophia update: I had to wake her up when Grant alerted the raccoon was back in the yard, so now she's intent upon eating history books: "your books are history". Man, I'm tired...But every day is full of adventure with the two Huskies being sweeter and cuter together. It's obvious Grant can't wait until she's big enough to play more. @aljones We just had to walk down to our dock in the backyard, so there will be time to get wet. 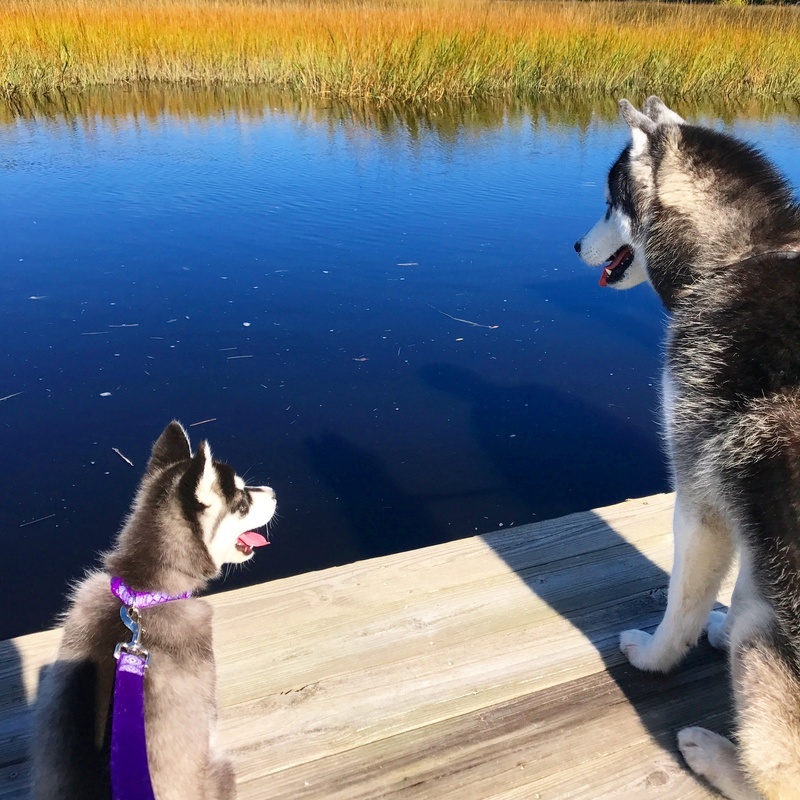 It was Sophia's first trek to the creek and she was mesmerized by the water and marsh hens. For the record, she did try to fall in. First pic is sideways for people on regular computers, I saw it while I was on my laptop. On my iPad they're all good though! Grant wades in the swimming pool, but no, seriously, to go on the water in a boat is the extent of the forays into the creek and marsh. We are shopping a snake fence installer because alligators and water moccasins are a thing in Florida. Supervision is just a way of life out here in the estuary. His ears are soft and I wish he were fonder of my petting them. Something I've found with Avalanche and his ears ... if I "play" with them he objects; if I scratch the inside of them it's worse than if I gave him a belly rub - he's in 70000th heaven!!! Avalanche has always been a bit of an odd boy, if I grab his tail, he'll turn around and grab my hand - it's definitely not a bite, it's more a case of "If you grab me, I'll grab you! See how you like it!!" Ears are like "my thing" when it comes to Huskies...Malukhai, to me, had the perfect ears, they were small, had a really nice shape, and thick. I like Kohdi's ears, they "fit" him, Mishka's have a little too much of a point to them, but are nice and small like Malukhai's were. 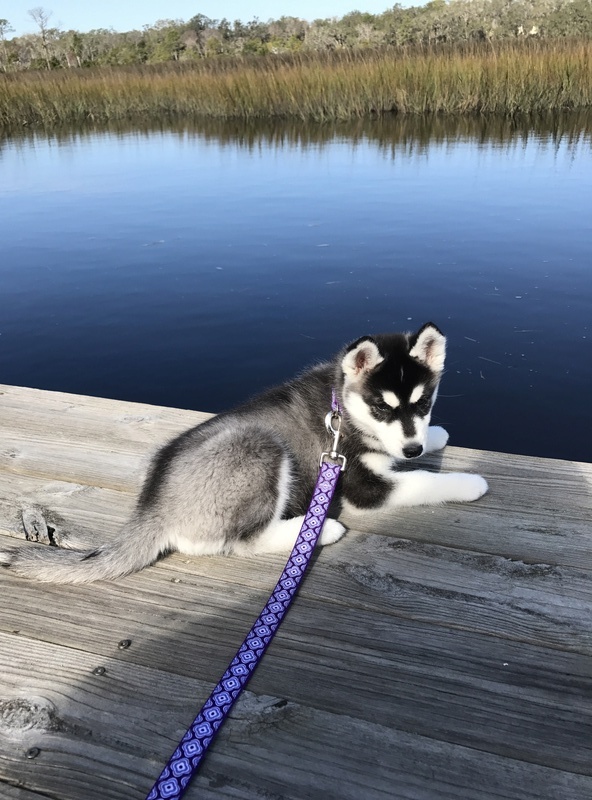 Although I do have my preferences, when it comes to choosing a puppy, eye color really didn't matter, coat color same thing, but my pup had to have nice ears, lol. @aljones Grant has moments lately where any attention is welcome, and I do grab his face and massage his ears in those moments, just like I do Sophia, who loves it. Gotta get your cuddles in while they're young! I guess you're lucky with Avalanche. @Artic_Wind I agree on ears, which is how I spot the breeder's Huskies. Haha Grant's looked "trained" and Sophia is elvin all over, so her ears are always in a new position. I hope they are thick like Grant's. 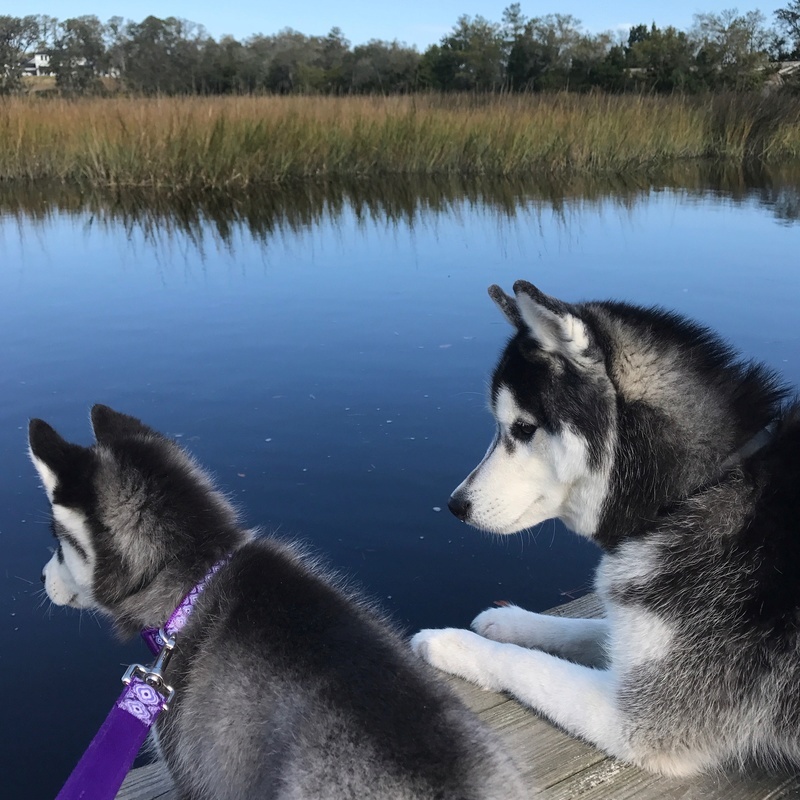 Kohdi's are really alert and cute. I think both your babies are perfect. I hope Sophia keeps her natural "watch me"... Training her is almost too easy, so I'm enjoying it while it lasts. She even knows "wait", but I cannot imagine this will last. Wow...up here in the 15° temps whoever heard of a "snake fence installer?!!?" Amy, we secretly try to scare off those who would move to Florida by going on and on about allergies, alligators, sharks, snakes... In the Midwest, I almost died of allergies and I've encountered more venomous snakes in North Carolina, Texas, and New Mexico than here. That said, I insist on living on the water in Florida, thus inviting encounters most never experience. I'm a fearless person, but fiercely protective of my babies. For a person who wants to be outdoors every day with the Huskies, nowhere could be finer. Bundling up to go outside was fun when I was 10, but I prefer a tank top and shorts all year in my old age. It's freezing here today, by the way: in the 40s! Jacket weather, ugh. Ears! Yes! Love the ears! Husky ears are the best, though I would put Shiba Inu ears up there, too. Just wuv those fuzzy wuzzy widdle ears ... The PERFECT dog ears. The way dog ears SHOULD be. No offense, Chris (and other Florida dwellers), but you can keep Florida. I have family there and I spent a huge chunk of my childhood and teenage/college years there, but I just can't stand living there. Too hot, too crowded (though not as bad as California or Chicago), lousy traffic, overpriced EVERYTHING, etc., etc. ... Plus I'd get sick and tired of having to move inland every single time there's a hurricane, like my dad does (he lives in a condo at Treasure Island on the gulf side). I do also prefer a more blatant change of seasons as opposed to "less rain/more rain." I like winter clothing and boots, fleece blankets, and a nice, roaring fire. Snuggly! Don't take it personally. I feel pretty much the same way about Hawai'i -- and I LOVE Hawai'i. Indiana isn't perfect, and yeah it gets pretty darn cold here in the wintertime, but I'm afraid I'm a Hoosier through and through. When it comes to pickin' my natural disasters, I'll take the occasional tornado, flood, or ice storm any day over hurricanes, tropical storms, wildfires, sink holes, mudslides, earthquakes ... though Indiana is supposedly 100 years overdue for the "Big One" (earthquake). I've camped in Brown County with family, Faye, and it is lovely in the fall. I love cabin camping in the mountains, but a little farther south. Travel satisfies my need for cold, then it's back home to warmth. Picking up Sophia in Michigan was a grand adventure, but lugging hiking boots and a parka in my carry-on, in addition to the pet carrier, reminded me I'm a runner because I don't like equipment. So we can agree that we like to visit each other's states but wouldn't want to live there. As a side note, I've wanted to live exactly where I live since childhood, while my child grew up warm by the water and fancies moving to the mountains. I think it's nice that we don't always grow up in our perfect place, but get to choose it at some point. We are privileged. Chris - my sil is in Port Charlotte. Her backyard gardens look like something out of Disney! BUt she is unable to grow anything edible because of ...damn, forget the name. Its a tree dwelling...roof rats, maybe? She did everything she could think of and finally gave up as the ate everything. Yes, Amy, we run in mornings and evenings, then it's A/C and siesta all day (sleeping while I work). I'll never retire, so it's a sustainable schedule. As for gardening, I have a large raised bed with mosquito netting which Reduces the moths caterpillars enough to end up with edibles. But the flower gardens, watergarden, butterfly garden, trellises...all the ornamentals and flowering natives thrive. Despite squirrels, haha. I like the seasons in North Florida better than the subtropical south, though. Thank you Chris! I think Kohdi and Mishka are pretty perfect in their own ways, but I'm biased Kohdi is the spitting image of his dad in color, fluff, and structure, but his dad has a different mask and two brown/gold eyes. Kohdi has his moms markings. While Mishka has the look and structure of her mom (her dad was tiny too though, but a really light red) but her mask is identical to...KOHDI'S dad, hahaha. It's weird. It's been fun reading all your posts about where you live, want to live, don't want to live, LOLOL. Amy, I'm the polar opposite of you, I thrive in the heat, but when it's cold, I don't wanna move, haha. As much as I think all your homes are so beautiful, I'd never want to leave San Diego. It's super expensive, I don't get snow outside my door, but my pups are happy here, and so am I. They're part of the same line, then, Jimmy? Grant and Sophia are, as you know, and you may be right about Sophia ending up with an Aurora Thunder (Grant's mom) mask. Here Is a backyard shot with the football. 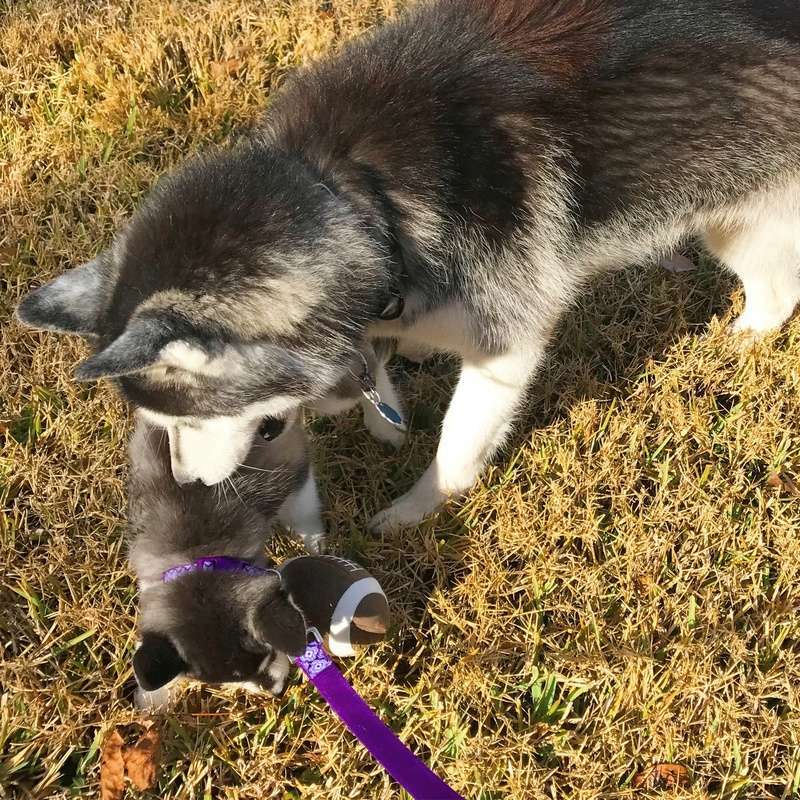 I added one to the calendar page, but it's hard to take good photos with Sophia on a leash. Still, I love photos of the two playing together. Grant is surprisingly gentle, and is teaching Sophia to be.